Before I get chemo, Doctor Li wants to check my blood to make sure I’m healthy enough to handle the chemo. I got a chance to see the results from my blood tests before my second round of chemo. 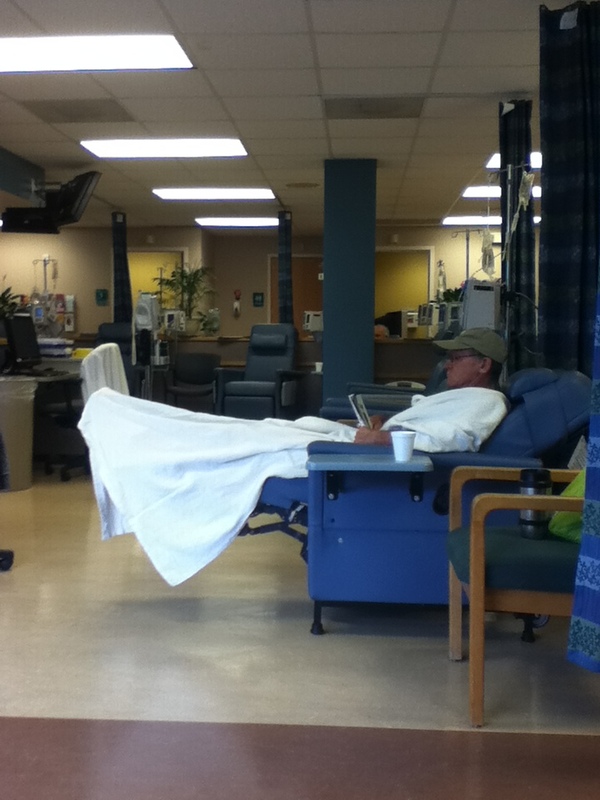 Most things were good, including the counts of my red and white blood cells and my platelets. I had two problematic areas, though – my hemoglobin and hemocrit levels were low and my liver enzymes were high. None of it was bad enough to cancel chemo, but it was something to watch. In fact, Dr. Li ordered a blood test of my iron levels that day. Blood tests after chemo are great – since the needle is still in the port I don’t need another hole put into my veins. My iron levels must have come back low, because Dr. Li ordered iron infusions on the weeks I’m not doing chemo. Now, I would like to avoid any more drugs put into my system, but at the same time I need enough iron for my red blood cells to function correctly. Therefore, I’ve tried to add more iron rich foods to my diet in the hopes of avoiding the infusions. This has involved a couple of changes. I’ve been trying to eat more greens (Swiss chard in particular, this time of year), and I’ve been eating eggs more often. The eggs are easy since my mom’s chickens have started laying. Nothing better than fresh eggs from a known flock of chickens! I’ve also looked for more iron-rich snacks to eat, like nuts and sesame-based crunchies. The other trick to adding iron is to make sure I get some vitamin C at the same time I’m consuming the iron. The vitamin C helps the body to absorb the iron more effectively. At lunch, it’s not a problem since any fruit I’m going to eat is full of vitamin C (it’s blueberry/peach/watermelon season around here). At snack, I might add some dried fruit to the nuts I’m eating. I also am sure to drink juice when I take my daily vitamin. My liver is a little trickier to help. StatsGuy heard from a colleague who went through chemo last year (for stomach cancer) that avocado can be beneficial to the liver, so he went out a bought a couple. Too bad I eat them so slowly, since the second one went bad before I could eat it. The other thing I’m doing is cutting out alcohol completely. It’s not something I should have often on chemo (since it’s a blood thinner), but I had a couple of beers on vacation. I figure my liver doesn’t need any more work to do, and alcohol is an easy one to cut out. We’ll see how I’ve done when I go back on Thursday for the next round of chemo. I’m hoping the problematic numbers at least held steady, but I won’t know for a few days. This entry was posted on August 31, 2013, in chemotherapy and tagged blood counts, diet, Dr. Li, side effects. One of the side effects of chemo everyone knows about is hair loss, but it doesn’t happen the way you think it does. I was very concerned about when the hair loss would start. Turns out, it really depends on the type of chemo drugs you’re getting. The nurse who did my first round of chemo told me most people start losing their hair twelve days after the first round of chemo. That’s why I got my hair cut before going to Montreal. Realization #1: Hair on different parts of your body falls off at different times. Realization #2: The hair does not all fall out at once. It did not come out in clumps, like I thought. I did not wake up with a pile of hair on my pillow, like I thought. Instead, what happened was every time I ran my fingers through my hair, a few hairs would come out. It was kind of like when you brush your hair, but much more constant. My scalp was also very tender. This lasted for a few days before I started to notice bare patches on the sides. I had to wear a hat all the time just to keep my hands out of my hair, since I didn’t want all that hair on the floor. My new look – I think my hats look stylish, but anyone who knows someone who’s gone through chemo recognizes me as a chemo patient. I still have a faint corona of hair. I think the lack of hair makes my face look much thinner. Realization #3: The hair loss takes a long time. I could just shave it down to nothing, but I kind of want to keep the stubble as long as possible. My eyebrows are a little thinner, but still there. My leg hair has just started to fall out (that one I’m not sad about – I’m hoping I’ve shaved for the last time for a couple of months), but my arm hair seems firmly rooted. We’ll see if I get a new wave of falling out next week after this second round of chemo. 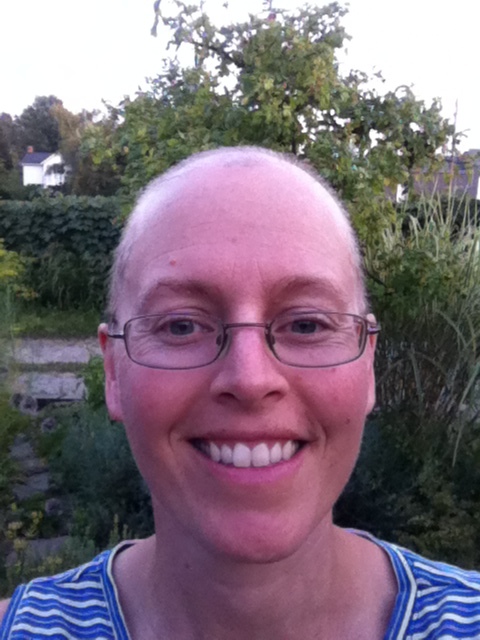 This entry was posted on August 26, 2013, in chemotherapy and tagged hair loss, side effects. I had my second cycle of chemo a week ago now, so I’m able to compare how I felt after the first round to how I felt after the second round. I will admit to keeping what is essentially a “cancer journal,” which includes all the tests I went through and how I feel each day after chemo. This helps me, personally, since I am a scientist and am curious to see if there are patterns. It also helps because I can’t remember exactly what happened three weeks ago, but it’s easy enough to look it up in my book and kind of know what to expect. Even with those two energy-saving activities, though, I don’t think it completely explains the lack of crushing exhaustion and need for multiple naps a day. My current hypothesis is the chemo killed so many cancer cells the first time around that my body was overwhelmed trying to flush the dead cells from the system and was exhausted. My tumor shrunk a good 1/2-2/3rds in size after the first chemo, with not near so noticeable changes this time. So, my body hasn’t had to deal with quite so much this time around. 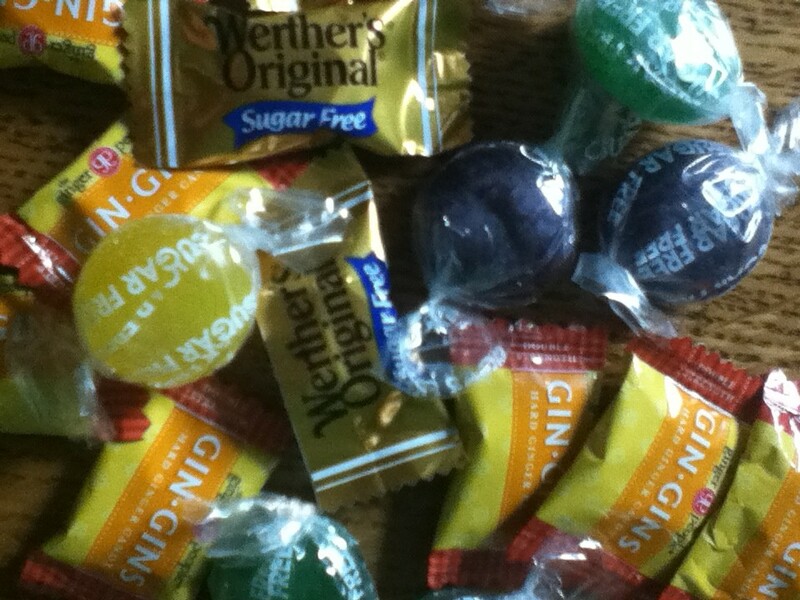 I have been much more aware of the taste changes and metallic taste in my mouth. The faint nausea I feel much of the time is really due to the nasty taste in my mouth, which luckily can be removed by sucking on some hard candy. I just have to remember to do it. I also end up brushing my teeth a lot to get rid of the taste. I’m becoming quite a connoisseur of Gatorade. Or at least I’ve discovered I really only like the Lemon-Lime flavor. Yesterday was probably the hardest. It seems that six days after chemo, the digestive tract finally recognizes that some nasty drugs were injected into the body, and it starts to rebel. Luckily, the Zofran works better than the Compozine, so I only needed an hour or so of quiet time on the couch to quell the rising nausea. I didn’t even need to employ the “Daggers of Hate” from the eyes in order to be left alone. Amazingly, I even managed to eat a bit for dinner. Not quite up to usual portion sizes, but at least I’m still eating consistently and even have an appetite for most meals. Overall, it’s been easier this time around. It’s two down and four to go. One-third done, and the next one will make it half done. Counting down the days. 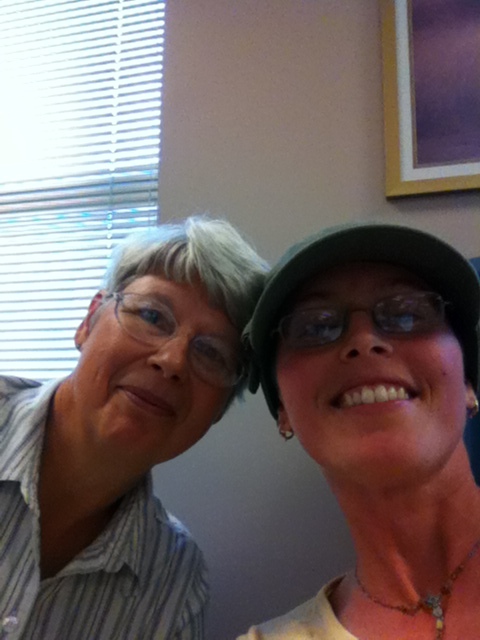 This entry was posted on August 21, 2013, in chemotherapy and tagged side effects. Everyone knows about the basic impacts of chemo – you lose your hair, it messes with your blood (anemia, increased risk of infection, etc. ), and it messes with your digestive tract (nausea, loss of appetite). One of the side effects of my particular flavor of chemo is changes in taste, caused by the platinum-based Carboplatin chemo drug. Interestingly enough, my taste buds start to be affected pretty much that night. The first change I notice, is that water no longer tastes good plain. Now, I drink a lot of water. You’ll always find me with my cup full of water around the house, or a water bottle if I go out, so it’s a big change for me not to want to drink water. I tried adding mint leaves or lemon balm to the water, but it still didn’t taste right. Even my tea in the morning just isn’t quite right (but I drink it anyways). 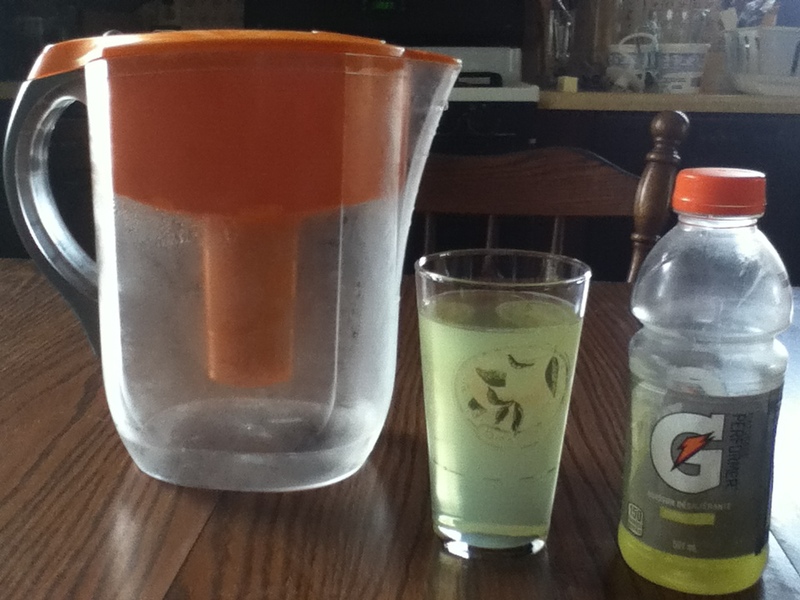 I started drinking Gatorade during the last cycle, since I was craving salty flavors (which is a big change for me since normally I think Gatorade tastes like spit). I asked StatGuy to go out and get me some Gatorade, and he came home with six different flavors. So far, lemonade has been the best. At one point, I put a bit of Gatorade in my water bottle with lots of water, and it still tasted good, so that’s what I’ve been drinking lately. The other big change is my lack of desire for sweets. Normally, my lunch isn’t finished without a cookie to top it off, but in that initial week after chemo, those taste buds seem to be down-regulated and sweets just aren’t worth the effort for me. Potato chips are quite tasty, though, so that’s been my treat of choice this week. I have to be careful with even chips, though. I tried Cool Ranch Doritos, and they were actively nasty. Hint of Lime Tostitos, which are normally a favorite, were absolutely flat, with no lime taste at all. How disappointing. The trick is finding something that’s at least somewhat appealing so I get some calories in my body. I’m at the point now where I only tell acquaintances if the chemo somehow affects plans that are being made. I was a little afraid that once I cut my hair, it would come up in casual conversation more easily and I’d end up telling more people. It’s not that I don’t want people to know, but it’s such a shock when telling anyone that I feel bad for them that I have cancer. Needless to say, it’s not a conversation I seek out. So far, no one has asked why I cut my hair, and my new hats cover up the fact that there’s nothing much left on my scalp, but I’m sure the question’s coming. It’s also not something I’m sharing publicly on Facebook, either. I am a fairly private person. I’ve told a few good friends that have moved out-of-town, but it’s too personal to share with all my random old high school friends or friends of friends. So, there have been many days where I’ve been silent on Facebook because the only things I could say had to do with doctor’s appointments or chemotherapy. It’s a hard decision whether or not to tell someone, and I have to remind myself not to feel guilty for not wanting to have to share my cancer diagnosis. It’s my information that I get to decide who to tell. This entry was posted on August 14, 2013, in Uncategorized. Sorry I haven’t posted in a while, but I just came back from a week in Montreal. Luckily, all of my side effects pretty much disappeared the day I got to Montreal. It was like someone flipped a switch and I was back to my old self, and just in time to enjoy a vacation. Before I left for Montreal, I had one more big step to make – getting my hair cut. Now, you have to understand that I have had long hair for a long time. I can remember getting my hair cut exactly once – in middle school, and I got it cut to my shoulder blades. By first grade, it was at my shoulders, and it’s only gotten longer. I’ve been psyching myself up to get it cut since I found out I’d be getting chemo first. Now, the rule has always been in the house that I get to have the longest hair (StatGuy also has long hair). 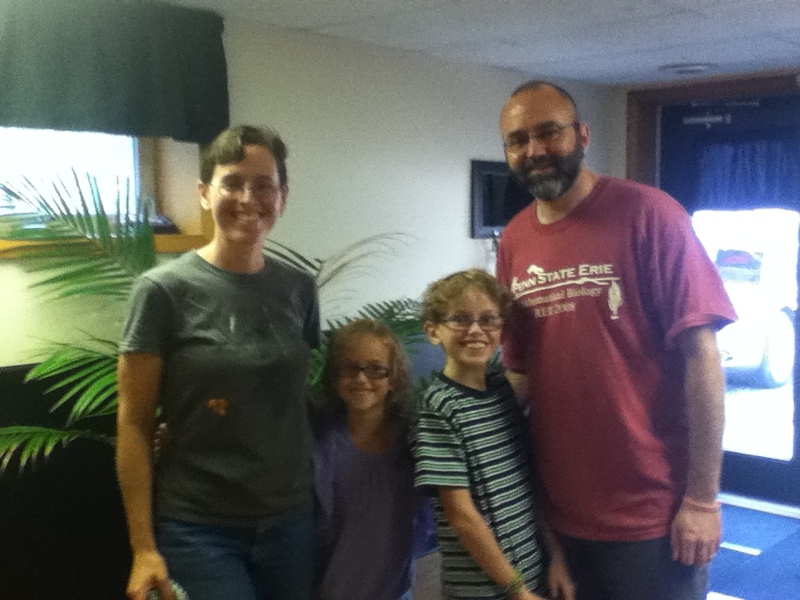 So, the whole family went to the hairdresser the day before we left for Montreal. The nurse had said it was likely to start thinning 12 days after chemo, which would be while we were in Montreal. I figured, if I was going to have to cut my hair, I at least wanted something good to come of it. Therefore, the plan was to donate my and StatGuys’s hair to Locks of Love. 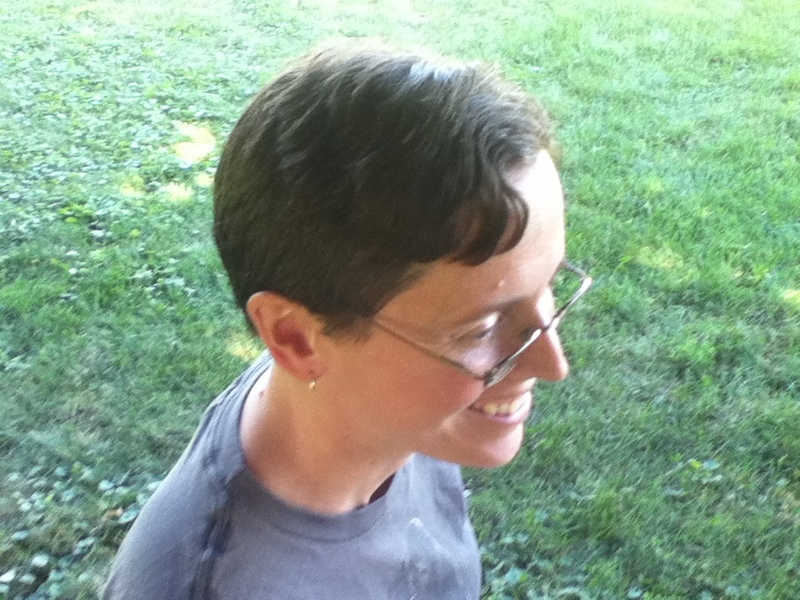 Besides, if I cut it before vacation, I’d at least be distracted from the lack of hair by being in a new city. 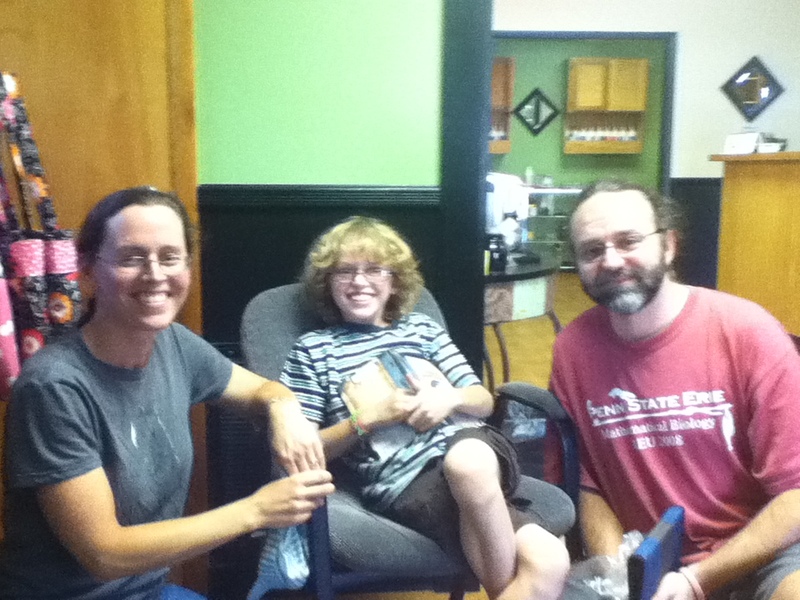 Miss Adventure had said all along she wasn’t going to get her hair cut, but she decided to join in the family fun. I got mine cut an inch long, but left it a couple of inches long just on top so it looked like I had a bit of style to it and not like I just got out of jail. StatGuy went with shaved to the scalp, but the kids just got it cut shorter than before. I was surprised that I kind of liked the haircut. The little flip on of the bangs was my natural curls asserting themselves. Even though I say I like it, though, I won’t go out in public without a hat. I still technically have hair, I just don’t feel comfortable with people seeing it. The other problem is now I have to talk about why I cut my hair to acquaintances who I haven’t told that I have breast cancer. It’s not something I want to talk about with everyone I meet, but losing my hair makes it more likely that it comes up in casual conversation. You couldn’t tell in the previous photos, but there was a lot of hair there. 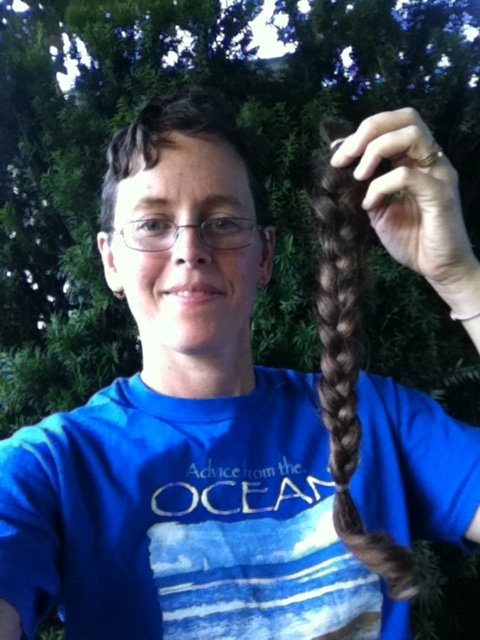 I had 16″ of braid to donate. StatGuy managed 14″ when you stretched out his curls. I did appreciate having a week to get used to very little hair before having to transition to no hair, so I’m glad I cut my hair before it started falling out. It wasn’t the original plan, but it worked out better than the original plan. 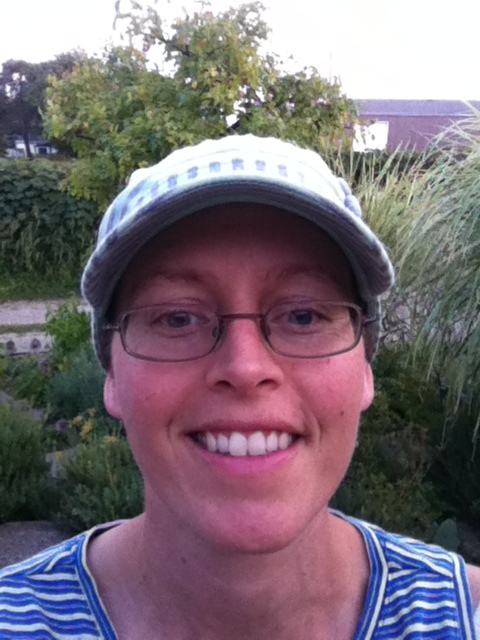 This entry was posted on August 12, 2013, in chemotherapy and tagged hair loss, side effects.